P3 Legislation in El Salvador: An Aggressive Reassertion of Neoliberal Economics? Over the past several weeks, El Salvador has begun to restructure its port and electricity services as the first consequence of the newly enacted Ley de Asocio Público-Privados (Public-Private Partnership Law; P3), which took effect in El Salvador on June 16 after legislative approval on May 23. A history of unsuccessful privatization measures in El Salvador indicates that this economic policy will threaten many Salvadorans while doing little to promote genuinely productive economic activity in the region. In fact, the law is evidently aimed more at opening new markets and increasing profits for large foreign corporations than improving the lives of average Salvadoran citizens. However, P3 not only achieved unanimous approval in the Salvadoran legislature after merely two days of discussion, but did so with the support of President Mauricio Funes of the Farabundo Marti Liberation Front (FMLN). The implementation of this anachronistic neoliberal policy by a president whose party, the FMLN, had previously opposed privatization not only underlines a consistently unproductive relationship between the United States and El Salvador, but also reveals much about the internal tensions of the FMLN party that may have significant implications for the upcoming 2014 Salvadoran presidential elections. The new P3 measure was drafted as a joint effort between the ruling Funes Administration, Washington, the International Monetary Fund (IMF), and the World Bank (WB) in the name of efficiency and economic development. Although El Salvador is currently the most cost-effective country in Latin America to do business with, according to the U.S. Department of State, inconsistent commercial regulation, violent crime, and an erratic legal system over the past decade have perpetuated stunted foreign direct investment in the nation. P3 was designed to encourage investment by eliminating much of the red tape surrounding privatization. In its original form, the law created a mechanism to auction off 40-year renewable terms of ownership (referred to as ‘concessions’) to private investors, starting with the ports and airports, but eventually opening the country to private investment in all public goods and services. Additionally, the original stipulations offered a reward of 1 percent of concession sales to be paid to losing bidders, set a time limit for all privatization decisions, and transferred all privatization decisions from the Salvadoran legislature to an executive body. 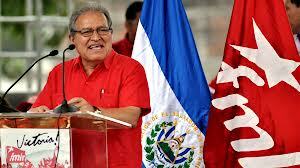 Funes and other FMLN party leaders made several important reforms to the bill before its passage. Article 3, added by FMLN legislators during the reform process, aims to protect water, education, prisons, healthcare, and social security (ISSS) from private ownership. Additional revisions eliminate the time limit for privatization decisions, and the 40-year contracts are no longer renewable. To reduce executive power, the FMLN reformers established a body within the Ministry of Economy called the Public Private Partnership Directorate that is responsible for managing P3 contracts. These reforms were essential in moderating the extreme stipulations of the original bill. In spite of the reforms, P3 has experienced fervent opposition from an array of social organizations. 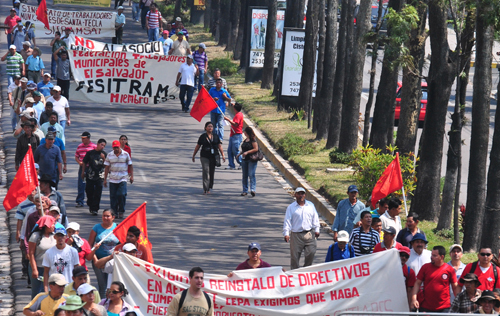 Over 80,000 activists from labor unions, environmental groups, regional organizations, and even the private sector mobilized for the International Workers Day March in San Salvador on May 1. The protesters recognize P3 as the continuation of a historical record of unproductive neoliberal economic initiatives in El Salvador and worry that the next wave of privatization measures will repeat past failures. Indeed, their protests are not unprecedented. In 1992, at the conclusion of El Salvador’s bloody 12-year civil war, the ruling right-wing National Republican Alliance (ARENA) party initiated a series of neoliberal reforms under the auspices of the Bretton Woods organizations that aimed to “modernize” the economy. These measures included adopting the U.S. dollar and forming bilateral trade agreements with the United States. Significantly, El Salvador was the first country to sign on to the Dominican Republic Central American Free Trade Agreement (CAFTA-DR). Privatization was a tool that stood out among these policies. Over the period of 1989-2009, the government sold off assets totaling $5.7 billion USD, but ultimately only received $337 million USD in returns. Meanwhile, according to the Central American University, the corporations that acquired privatized industries “made over $271 billion [USD] in 2007 alone.”  Although privatizations occurred over a broad array of industries that included the restructuring of banks and telecommunications, some of the most telling effects have been demonstrated in the electricity, port, and energy sectors. Following these events, El Salvador’s ports and airports were privatized in 2001. According to Dollars and Sense, nearly 1,000 workers were laid off at the Acajutla port alone following a series of privatizations. When security, cleaning, and cargo services at El Salvador International Airport were outsourced to private companies that year, average wages in these sectors decreased from $552 USD per month to $240 USD per month. Recognizing that private budgets were being bolstered at their expense, over 200,000 doctors, nurses, and ISSS workers successfully mobilized in a massive protest against a 2002 ARENA proposal to privatize healthcare. Similarly, communities and unions joined together to halt a 2007 attempt to privatize water. The report went on to identify four specific companies with particularly abysmal human rights records. Significantly, the Rio Lempa Hydroelectric Company and the El Salvador International Airport, both of which have already begun restructuring under the new legislation, were included in this group. The students of El Salvador’s only public university, the University of El Salvador, have been similarly vocal in their opposition to P3. Although the reforms added by FMLN legislators theoretically protect higher education from privatization, students, in the words of Alan Marroquin, a member of the Community in Solidarity with the People of El Salvador, “suspect that internal directors are moving forward the privatization issue” by using loopholes in the language of the law to slowly privatize the public university. Private involvement will significantly raise tuition costs for students, negating the emphasis President Funes has placed on education during his term. For this reason, students at the University of El Salvador organized a rally on July 30 to protest privatization in higher education. As evident in the Bajo Lempa statement, Salvadoran social organizations are not oblivious to the foreign roots of this policy. Washington’s promotion of P3 has been blunt and unrelenting. The United States and the IMF have used financial conditionality to promote the interests of large multinational corporations, directing their influence in El Salvador through two specific U.S. programs: the Partnership for Growth (PFG) and the Millennium Challenge Corporation (MCC). To many, the passage of P3 legislation is less an indication of Funes’s policy direction than of the persistently invasive influence of U.S. interests on El Salvador. Not only do FMLN leaders and Funes himself operate under hegemonic pressure, but they do so in the context of a formerly contentious relationship. 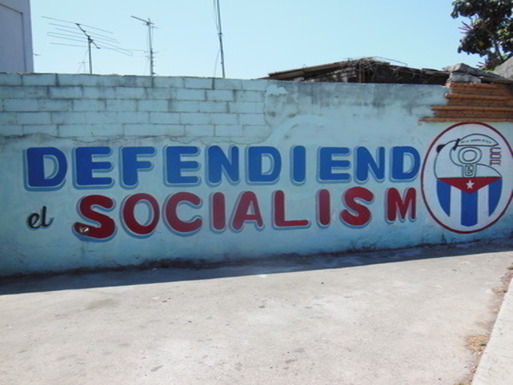 During the civil war, the U.S.-backed Salvadoran security forces fought against the FMLN, which at the time was a coalition of guerilla organizations and local radical groups. 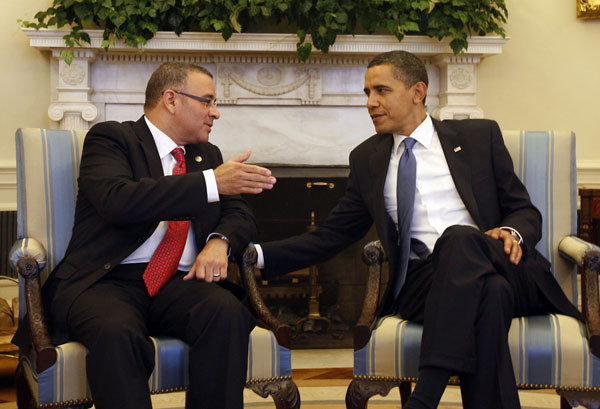 Throughout post-war election periods, U.S. officials consistently questioned FMLN legitimacy and commitment to democracy, asserting that U.S.-Salvadoran relations would be jeopardized were the FMLN to win the presidency. In this context, the decision by the FMLN leadership to adopt a heavily reformed version of P3 can be seen, at least in part, as a political move to appease the United States while allowing for minimal concessions by amending the legislation before its final passage. In a phone interview, a former Salvadoran judge in the exterior described this duplicity as unsurprising. He cited P3 as just one example of the many disappointments of the Funes administration. “I don’t believe Funes is different from the former leaders,” he said, referring to the right-wing ARENA party that maintained a 20-year hold on the executive branch until 2009. 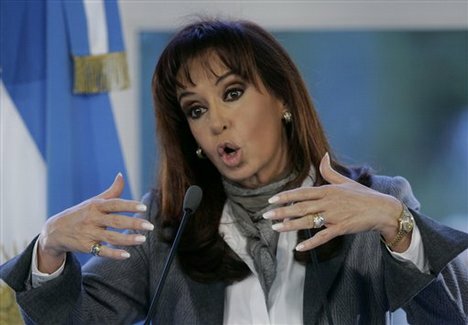 He pointed out that “while it is true [Funes] has invested in social programs” in the areas of education, health care, tax reform, and nutrition through his “el cambio” program, he also has neglected to touch other issues that his center, center-left, and left support base expected of him. Importantly, none of the former ARENA presidents have been prosecuted for corruption, nor have the individuals who participated in gross human rights abuses during the civil war. Despite a ruling by the Inter-American Human Rights Court in October 2012 demanding that the Funes Administration conduct an investigation into the 1991 El Mozote Massacre, the administration has failed to do so, a frustration for the many Salvadorans who voted for Funes with the hope that an FMLN-backed president would mark the end of gross impunity in the country. To an increasing number of Salvadorans, the maintenance of an amicable relationship with the United States is not a sufficient reason for failing to adhere to party norms and pursue long-overdue policies. This new privatization measure comes at a time when many Latin American countries are moving away from neoliberal economic policy and, as COHA Senior Research Fellow Dr. Ronn Pineo has written, are “reversing privatizations, advancing economic nationalism, and readopting and extending their social programs.”  It therefore remains to be seen whether P3 represents a genuinely renewed ideological faith in neoliberal economics in the region, or merely serves as an example of multinational corporations’ global push to privatize in their relentless pursuit of profit. Perhaps the most promising aspect of the P3 passage is the speed with which it was implemented. If the Funes Administration were to pursue with equal emphasis other proposals such as Article 69 of the Constitution, which establishes the right to water and food, and the General Law on Water, the administration might be in a better position to claim a commitment to the principle that the people of El Salvador themselves are worth investing in. 1. “El Gobierno Prepara Primeros Asocios Public Privados,” Contrapunto, May 28, 2013, http://www.contrapunto.com.sv/coyuntura/el-gobierno-prepara-primeros-asocios-publico-privados. 2. “2012 Investment Climate Statement: El Salvador,” U.S. Department of State: Diplomacy in Action, June 2012, http://www.state.gov/e/eb/rls/othr/ics/2012/191143.htm. 3. “Increased US Pressure Pushes Through P3 Law in Legislative Assembly,” Committee in Solidarity with the People of El Salvador, May 21, 2013, http://www.cispes.org/blog/increased-us-pressure-pushes-through-p3-law-in-legislative-assembly/. 4. “P3 Law Passes Amidst Protest from Social Movement,” Committee in Solidarity with the People of El Salvador, May 27, 2013, http://www.cispes.org/blog/p3-law-passes-amidst-protest-from-social-movement/. 5. 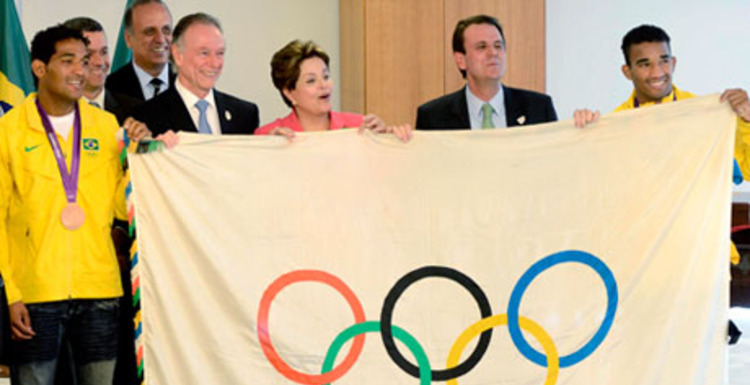 Elaine Freedman, “Public-Private Partnerships: Another Disguise for Privatization,” Revista Envío, http://www.envio.org.ni/articulo/4542. 6. “Privatization of Electricity Distribution in El Salvador: A Summary Report,” Saprin El Salvador, http://www.saprin.org/elsalvador/elsalvador.htm. 10. “Changing Seasons in El Salvador’s Battle Against Privatization,” Labor Notes, March 2003, http://www.democracyuprising.com/2003/03/changing-seasons-in-el-salvadors-battle-against-privatization/. 11. Hilary Goodfriend, “P3 Push in El Salvador,” Dollars and Sense, March 2013, http://www.dollarsandsense.org/archives/2013/0313goodfriend.html. 12. 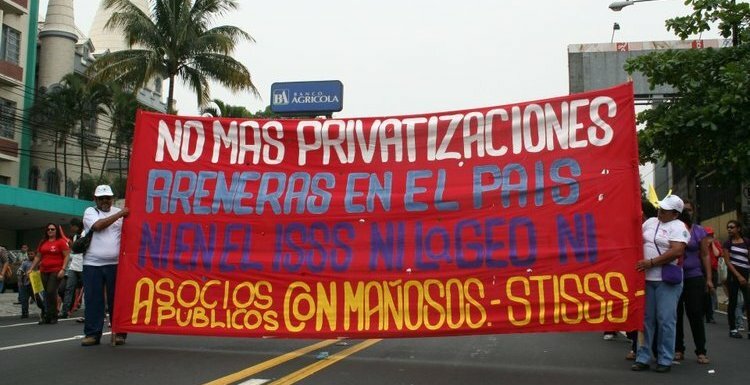 “El Salvador Investigates Public Private Energy Contract Amidst Debate for New State Concessions Law,” http://www.cispes.org/blog/el-salvador-investigates-public-private-energy-contract-amidst-debate-for-new-state-concessions-law/. 13. “Deliberate Indifference: El Salvador’s Failure to Protect Workers Rights,” Human Rights Watch, December 13, 2003, http://voiceselsalvador.wordpress.com/. 14. Alan Marroquin, E-mail Interview, July 30, 2013. 15. “The Salvadoran Round Table Against Mining Releases a Statement Against the P3 Law,” Voices on from El Salvador, May 24, 2013. 16. “Bajo Lempa Rejects the Public-Private Partnership Law,” Voices from El Salvador, May 29, 2013, http://voiceselsalvador.wordpress.com/. 18. “El Salvador Compact,” Millenium Challenge Corporation, http://www.mcc.gov/pages/countries/program/el-salvador-compact. 19. “US Embassy and Arena Go On Offensive As Salvadoran Legislature Studies Public-Private Partnership,” Committee in Solidarity with the People of El Salvador, January, 22, 2013. 21. Daniel Joya, Phone Interview, June 22, 2013. 23. Mills, Frederick B. “The 2014 Presidential Elections in El Salvador, The Debate on the Salvadoran Left,” Council on Hemispheric Affairs, April 18, 2013. 24. “Momentum Against the MCC and Other U.S. Policies May be Building,” Voices on the Border, May 3, 2013, http://voiceselsalvador.wordpress.com/?s=ceren&submit=Search. 26. “Latest Presidential Polls out of El Salvador,” Voices on the Border, May 28, 2013, http://voiceselsalvador.wordpress.com/. 27. Ronn Pineo. “The Free Market Experiment in Latin America: Assesing Past Policies and the Search for a Pathway Forward,” April 17, 2013. http://www.coha.org/the-free-market-experiment-in-latin-america-assessing-past-policies-and-the-search-for-a-pathway-forward-part-three-the-last-of-three-parts/.